Yesterday Democratic Alaska Senator Mark Begich slammed former Alaska Governor Sarah Palin. 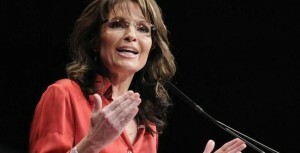 Palin announced earlier this week that she had been thinking about running for the Senate. Following former Alaska Gov. Sarah Palin’s (R) revelation that she’s considering a 2014 U.S. Senate run, Sen. Mark Begich (D), who currently holds the state’s seat, expressed doubts about her status as a resident of Alaska on four different occasions during a Wednesday interview with Politico. Palin responded to Begich on her Facebook page Thursday morning. Margaret Thatcher used to say, “I always cheer up immensely if an attack is particularly wounding because I think, well, if they attack one personally, it means they have not a single political argument left.” So, thank you, Mark Begich, for making me and others exceptionally cheery today! Mark, after looking at your voting record I can see why you are looking for a distraction. You have voted FOR Obamacare, FOR massive tax increases, FOR carbon taxes which could cost Alaskans 21,000 jobs, AGAINST pro-life legislation, and there’s so much more. You even flip-flopped to oppose the nation’s balanced budget amendment. You agree with, and vote with, ultra-liberal Senators Chuck Schumer and Harry Reid approximately 90% of the time. Mark, you recently said, “Alaskans pick who they want based on what’s good for Alaska.” Couldn’t agree more, Mark, which is why many hope to see great changes for our great state following the upcoming 2014 election. In the meantime, we suppose we’ll see much more playing of the ol’ Washington political game using those inside D.C. reporters each time you have to distract from yet another bad vote for Alaska in the U.S. Senate. It cheers us up and gives us good opportunity to remind Alaskans just how loyal to the Obama agenda you have been. Palin’s response sure sounds like a campaign platform to me and may serve as a big hint about what her future plans are.